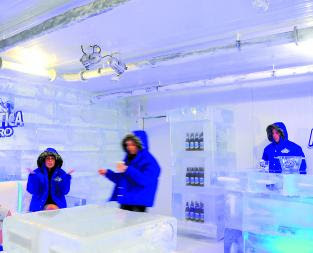 Installed in Pinheiros, a the igloo bar-shaped with about 300 square meters offers customers two environments: one is completely built on ice, including the whole furniture and items around the space and the other hosts the DJs and music attractions. The Estação Antarctica Sub Zero (Antarctica Sub Zero Station) structure doesn't melt because inside a chamber, where the visitors can stay, it's conditioned to -15°C. To get in it's necessary to wear special clothes prepared for low temperatures and 20 minutes is the maximum time allowed inside. The decoration has sculptures made on ice. The bar is itinerant and it's gonna be in town for just two weeks. So, be quick and get ready for a long queue. When: November 6th, 7th, 8th, 12th, 13th, 14th and 15th, Thursday to Friday, from 6pm till 2am; Saturday, from 4pm till midnight; Sunday, from 2pm till 10pm.